Nielsen’s tenure marked one of the most anti-immigrant periods in modern U.S. history, and one of the most deadly for asylum seekers and others migrating to the United States. Kirstjen Nielsen, secretary of the Department of Homeland Security (DHS), resigned on Sunday night, despite citing the “unprecedented action” the Trump administration has taken during her tenure “to protect Americans” in her resignation letter. “We have implemented historic efforts to defend our borders, combat illegal immigration, obstruct the inflow of drugs, and uphold our laws and values,” Nielsen further noted. Rewire.News has covered a number of those actions, and by our estimation, they did irrevocable harm to immigrant families—both those in the United States and around the world. Indeed, Nielsen’s tenure marked one of the most anti-immigrant periods in modern U.S. history. There were certainly other key figures from the Trump administration behind its anti-immigrant policies and rhetoric, including the president’s advisor Stephen Miller, who reportedly has been given “total control of border policy.” And there’s Nielsen’s acting replacement, Kevin McAleenan, the commissioner of Customs and Border Protection (CBP). McAleenan has been with CBP since 2001 and became acting head of the agency in January 2017, leading the agency as it implemented the family separation policy at the U.S.-Mexico border. Rewire.News compiled some of the most inhumane actions both defended and executed by Nielsen while serving in her role as secretary of DHS. Many of these efforts were horrific, direct attacks on immigrant children and families. Recent data suggests federal immigration agencies are still separating families at the border, despite Trump signing an executive order in June 2018 to end the policy. Even after Trump signed the executive order, the federal government missed several deadlines to reunite families known to have been subjected to the policy, and some families may never be reunited, including those comprising a child and a legal guardian. After Trump’s executive order purported to end family separation at the border, DHS quickly moved to expand further the practice of detaining migrant families together in the United States by challenging the Flores Settlement Agreement. Flores is essentially “the law of the land that governs the way that children can be detained,” according to advocates. The agreement requires that migrant children in federal immigration custody not be detained for more than 20 days; that they are placed with a close relative or family friend without delay; and that they are detained in the least restrictive conditions possible. Last fall, the administration proposed changes that would effectively terminate Flores. The changes included modifying “the provision that children must be transferred to a non-secure, licensed facility within three to five days of apprehension, which has been interpreted to allow for an extension of up to 20 days in times of “emergency” or “influx,” Human Rights First noted on its website. Under the proposed change, immigrant children would be subjected to indefinite detention, a practice known to be deeply harmful to their mental, physical, and emotional health. 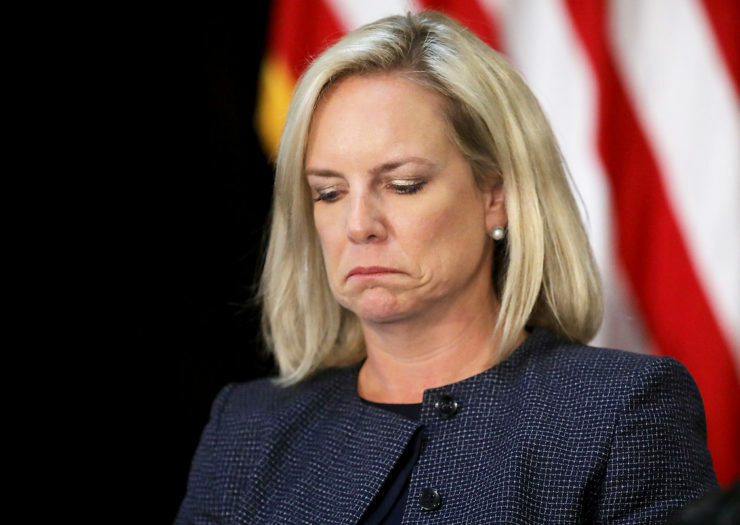 Nielsen has staunchly criticized Flores, referring to it as a “legal loophole” and “primary pull factor” for people migrating to the United States. Flores hinders DHS from detaining and “promptly remov[ing] family units that have no legal basis to remain in the country,” according to Nielsen. This is considered along with an immigrant’s age, health, family status, assets, resources, financial status, education, and skills, according to DHS. Estimated to affect about 382,000 people, the proposed rule change would bar those seeking to immigrate to the United States from being able to enter, and deny lawful permanent residents the ability to further adjust their status and naturalize, simply for accessing services for their families to which they are legally entitled. Over the span of two weeks last spring, Nielsen announced the termination of Temporary Protected Status (TPS) for Nepal and Honduras. In the months prior, TPS designations were terminated for Haiti, El Salvador, Sudan, Liberia, and Nicaragua. TPS is granted for three scenarios, according to U.S. Citizen and Immigration Services (USCIS): ongoing armed conflict, environmental disasters or epidemics, or other “extraordinary and temporary conditions.” Immigrants from countries granted TPS receive authorization to live and work in the United States. Deferred Enforced Departure (DED) offers benefits similar to TPS. In March 2018, Nielsen dutifully followed Trump’s order to “wind down” DED for Liberians in the United States, many of whom had been in the country for more than a decade. When ending TPS for Northern Triangle countries like El Salvador and Honduras, Nielsen said country conditions related to the TPS designation had improved, never mentioning the fact that El Salvador and Honduras have catastrophic levels of gang violence and some of the highest homicide rates in the world. And as Rewire.News has reported, some of the conditions in countries like El Salvador are the result of U.S. foreign policy. A federal court ordered TPS extensions for some of the countries that had their designations terminated under Nielsen, but enough damage had already been done. Hundreds of thousands of TPS recipients had been subjected to the fear of deportation, many of whom had U.S. citizen children. Under Nielsen’s watch as DHS secretary, at least two children died in federal custody—deaths she has blamed on their families. In December, 8-year-old Felipe Alonzo-Gomez and 7-year-old Jakelin Amei Rosmery Caal Maquin, died in CBP custody within weeks of each other. Nielsen has supported Trump’s near-constant threats to close the southern border, and sent a “surge” of troops to the border in response to Central American asylum seekers migrating to the United States. The secretary vigorously defended Trump’s order barring asylum for immigrants who enter the country outside a port of entry. She said at the time, “DHS and the administration will continue to take all possible actions to stop the caravan from entering the United States illegally without just cause,” despite a temporary court order blocking the administration from refusing the asylum seekers.